No room keys! 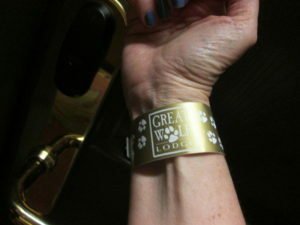 Your electronic wrist bands will get you into your room and let you charge food and items around the hotel. They do not give the kids these same wristbands, which means they can’t charge things (good), but they also can’t get into their room by themselves (bad). If your kids are young, that’s a bonus, but if they’re older, you may want to ask for an RFID wrist band for them. 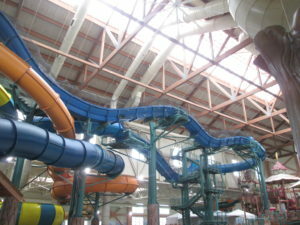 Some of the water slides had longer lines than I expected (maybe 20 minutes), though we were also there at changeover times. 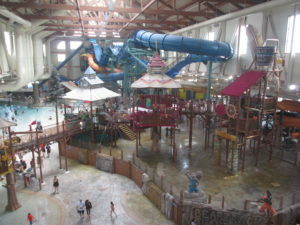 That’s essentially checkout time for those leaving the hotel (11 a.m.) and those coming in (new guests are allowed into the water park at 1:00 and departing guests can stay all day). By late afternoon, the lines were much better, though one slide, the Double Barrel Drop, still had long lines. The rest were quick. We were excited to try the slideboards, which look a bit like boogie boards with handles. 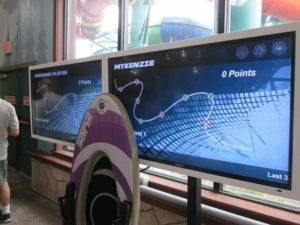 You can play a video-type game when going on one of two slides with them. First you log in at a kiosk and choose a name. Unfortunately, it said that all our names (except Zack) were inappropriate and they might boot us out if we keep trying to use these names. The names we tried, which were deemed inappropriate, were “JerseyKids,” “Jersey” and “Deb.” Even if you play without a name, you need to at least activate your board – preferably at the bottom, or you’ll have to activate it on top which wastes everyone’s time. You can ride the slide without activating your board, but it won’t monitor you and the slide lights won’t light up as you’re going through (the goal is to push the corresponding color button when going under that color LED display in the slide). We thought it was confusing. 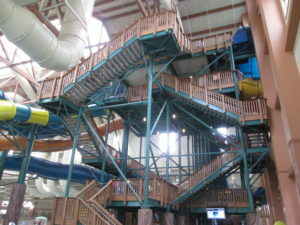 Plus when you start at the top, it blares out music at top volume, which scared the hell out of us. And only one of the tubes was working. Just a warning that the boards are a little heavy, so kids may need help with them. We did love the big kid (aka good for adults too) slides, which you access from the two towers you need to climb (good exercise). One tower you climb carrying nothing (rafts go up on a conveyor belt), and the other you need to bring a raft. There are signs at the bottom telling you what to do, but lots of people don’t look at them. As for which slide is most fun, it’s really a personal decision. We loved the Hydro Plunge, which is like a water slide roller coaster. It was partly on a motorized track, and was unlike any water slide we’ve been on. We also really enjoyed Coyote Canyon, which we called “the toilet bowl” as you spin around a drain and the go down the drain. They were all good slides, though. On the lily pads, try going fast, not slow. Going slow is a recipe for falling off, from personal experience. Granted, I never quite made it across going quickly either, but she who hesitates falls off – and likely strains a groin muscle. And if you’re really bad at it, just get off and give someone else a chance. There was one hopeless mom (not me, and not the one pictured) who was hogging the lily pads as she was so determined. But it was clear she’d never make it and the line just got longer and longer. Fortunately the lifeguard finally blew her whistle and told her to get off. Wherever there’s a drain on the ground, plan to get hit with unexpected water. When walking by Fort Mackenzie, keep looking up periodically. There will be people like my son and me waiting to dump a bucket of water on you if you venture right under. The tipping bucket ice cream treat is available in the pool area snack bar. Find extra people to help you finish this enormous dessert. Six of us dug in with long spoons (we marveled at how the plastic spoons turned blue when they were cold), and we failed to get to the bottom. The price? $14.50. But the excitement on the kids’ faces? Priceless. There are lots of lifeguards. The ones wearing red shirts are 15 years old. The ones in blue shirts are older. That’s just trivia for you to impress people. 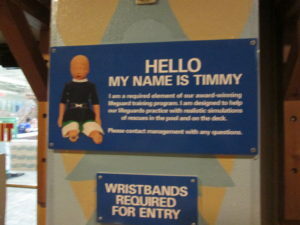 If you see a freaky baby named Timmy (not that you’d know his name – but you can see signs with his picture), that’s for lifeguard training. 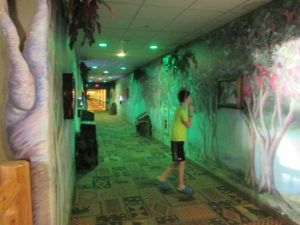 Don’t look behind the front desk in the water park area unless you want to get freaked out. We saw Timmy sprawled out there, looking very unhappy. Scary Timmy may be seen around the water park. Leave your jewelry in the room before going on water slides (there’s a safe in the room). It’s easy to lose an earring or other valuable. If you find a pearl earring in the water slide area, it’s mine. 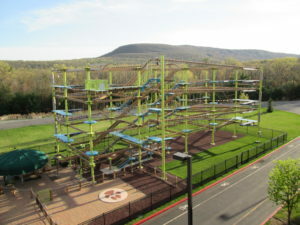 Howlers Peak is the climbing structure outside at Great Wolf Lodge Poconos and you need close-toe shoes (Crocs don’t count). 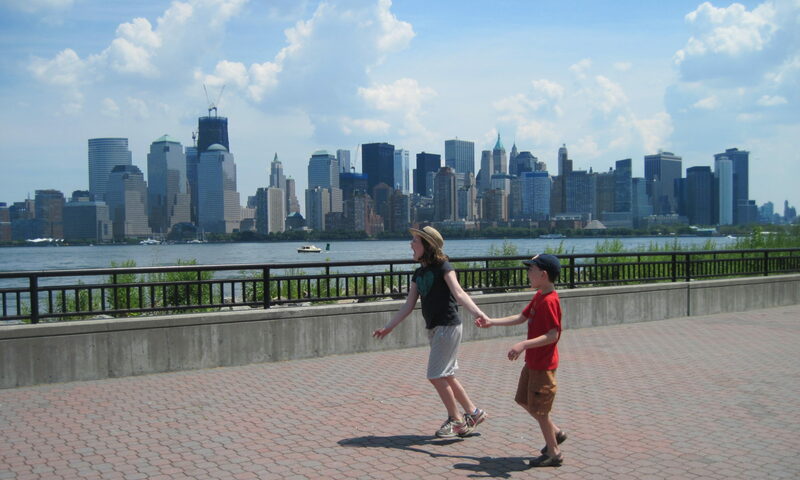 I insisted my son bring his sneakers, which he did under protest. Then he spent two hours outside climbing and ziplining and he said “you were right, Mom.” We’d done one of these climbing things at Diggerland, and didn’t stay on it that long, so I didn’t bother getting harnessed up. But I regretted not getting on there with the kids, as I was getting bored hanging out down below and they were having so much fun. I should have found someone to play giant-size Connect Four with me. 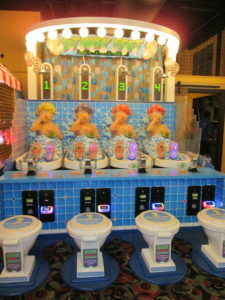 Your favorite game just might be Stinky Feet, where you sit on a toilet and shoot water at a guy in a bathtub. And when your son wins a stuffed narwahl for his older sister with a grabber game, you’ll see an amazing hug. You can feed dollar bills into the machine, but you can also purchase a card with “paw points.” Guaranteed this will not seem like money and you will go through that card so quickly you won’t know what hit you. And no matter how many people are at the redemption desk, you’ll spend a long time there. You’ll see kids walking around with special wolf ears – they have a little red party hat in the middle. If your kid will be celebrating a birthday, you can get the birthday package. 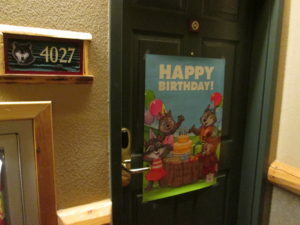 For $99 that includes a $40 food credit, $40 arcade credit, birthday cake, birthday poster on the door and special wolf ears for the birthday kid (not necessarily ears for all the kids in your family though). 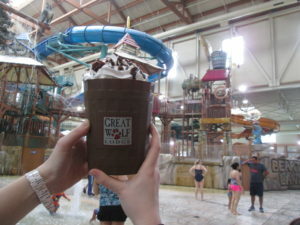 Yes, they have alcohol at Great Wolf Lodge. Even in the pool areas (indoor and outdoor)! 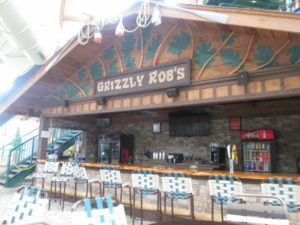 You can get mixed drinks, wine and even Great Wolf growlers of beer. There’s a bar in the hotel, and you can also order drinks at the restaurant. That said, it was nice not to see drunk people stumbling around. And I recommend not drinking and then going on the water slide. There’s also a nice-size fridge in your room. We saw lots of people carting in coolers. 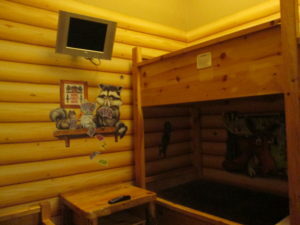 Speaking of alcohol…you’ve heard of turn down service (and the lodge provides this). But they’ve just introduced Wine Down service – starting after Memorial Day at the Texas and Virginia locations. 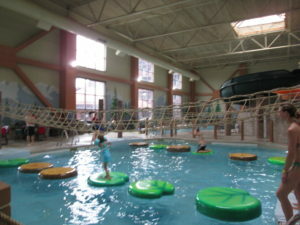 Since you can’t leave the kids alone in the room sleeping (though we’ve been tempted in the past – and have gone so far as to sit in the hallway with our drinks while the kids go to sleep), the Great Wolf Lodge developed a service for parents. You can order treats and wine pairings, delivered after your kids are in bed. Brilliant! Choose from special packages like “It’s Been A Fun-Filled Day, Time For Some Cabernet” and “Kids Snoring, More Pinot Noir-ing” (apologies – I didn’t come up with these names). Or choose from an a la carte menu. Some of the things you’ll find on the menu: chocolate truffles, cured meats and olives, brie and crackers, fruit, chocolate covered strawberries…along with a bottle of wine (Prosecco, Chardonnay, Cabernet or Pinot Noir). Packages start at $35 including delivery. 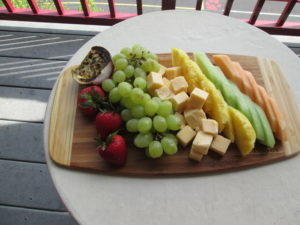 While we didn’t get to try this out, we did get a cheese plate and a dessert plate delivered to our room – it was classy. If it’s nice, take your food out to your porch or balcony. 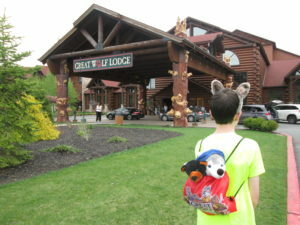 Teach your kids about the birds and the bees when getting their Great Wolf Lodge character stuffed. If you want a tantrum on your hands, take your little girls to see Scooops, the spa for kids, and don’t buy her anything or get her a spa treatment. 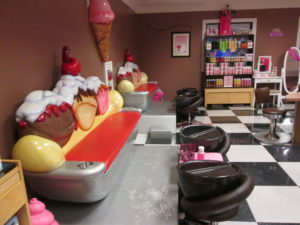 The ice cream themed spa is adorable and has a number of treatments for kids – and even for the accompanying adult (if you want side-by-side pedicures, for example). They also sell tons of scented products and other knick knacks. The Poconos location also has a spa for adults – it looked fabulous, and they offer all services but hair styling/cutting. We thought we’d spend our entire day in the water park. Turns out there’s a ton of other stuff to do. Yoga for kids at 8 a.m. (so cute). Various craft activities throughout the day, ranging from button making to balloon animals (receiving, not making). Story times and a dance party in the evening (with characters). 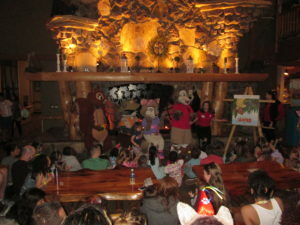 And several Forest Friends shows at the big tree (animatronic storytime). Plus independent character visits. And these were all free. Pay extra and try the glow-in-the-dark 9 hole mini golf course, the 10-paw mini bowling or the 4-D movie. Some of these come with the Paw Pass, a discounted pass where kids get a bunch of different activities included. Yes, to play the MagiQuest games, you need to pay $15 for the game. But the wand still opens things and lights things up. So if you’re low on time, or your kids are really young. Just use the wand for fun. That said, kids really enjoy the game, and it keeps them active (and tires them out). Don’t be lazy! Those elevators take forever! Unless you have luggage, just take the stairs. It will be faster and you need the exercise. Yes, they cost more. Yes, the standard rooms are spacious. But the theme rooms will make your kids so happy. And you’ll think they’re cute too. Disclosure: We were guests of Great Wolf Lodge for purposes of review. All opinions are our own. can i just walk in and play magiquest or do i need a room there? That’s a great question which I hadn’t thought about before! You can just walk in a play. 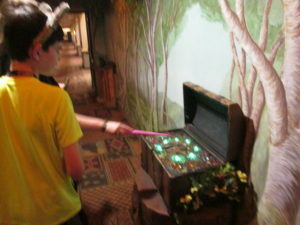 Go to the gift shop to get your MagiQuest wands and then head up a flight of stairs to start playing! There’s no pass or wristband needed (like you need for the waterpark). 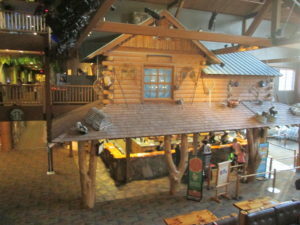 The hotel lobby and open areas where it’s played is open to the public. Kiana – if you’re not staying there, I think the only way you can get a wristband is if someone staying there buys one for you. My understanding is that you can buy as many guest passes as room guests, but you’d want to ask the lodge directly to be sure. As for arcade access, I think you can just walk in and buy an arcade card for the amount you want. Next PostNext Waitress Broadway Review: Is Waitress Appropriate for Kids?